Under the chart of accounts the direct expenses are listed separately but when the P&L is run they are listed under overheads. However, this distorts the Gross Profit figure as the Cost of Sales is not including direct expenses. Is there a way to amend the format of the P&L so that it shows Turnover less Cost of Sales less Direct Expenses = Gross Profit? There isn’t a way to reclassify the already existing nominal codes, but you’re welcome to create new ones in the relevant categories that you wish. If you’ve already used nominals and need to update previous invoices, you can also use the bulk re-code tool to move these. Simply view the original nominal code, and the option will appear at the top of the screen for you. We have created new nominal codes in the 6000 to 6999 range (listed as Direct Expenses) and would have expected them to appear in the ‘Cost of Sales’ or Direct Expenses section of the P&L but they’re still included in the Overheads section. I would like to count Direct Labour and associated costs into the cost of sales (Direct or Variable) cost section of the report. From @Bookkeeperkat 's submission above, the only option currently appears to be creating a new P&L report? Cost of Goods sold is in the range of 5000-5999. If you’d like these items to appear under the COGs section of the P&L they would need to be either re-coded or journalled to a nominal code in that range. I’m a bit puzzled by the terminology … I would have thought that ‘Direct’ intimates that it is a cost associated directly with sales… hence the name. Most of my career has been in the manufacturing industry where ‘direct labour’ is a cost of sale i.e. a direct cost or a variable cost for where labour is applied to material. I am now involved in retail but still consider that labour associated with the sales floor is a ‘direct cost’ i.e. if sales increase we are likely to increase this labour cost and vice versa. 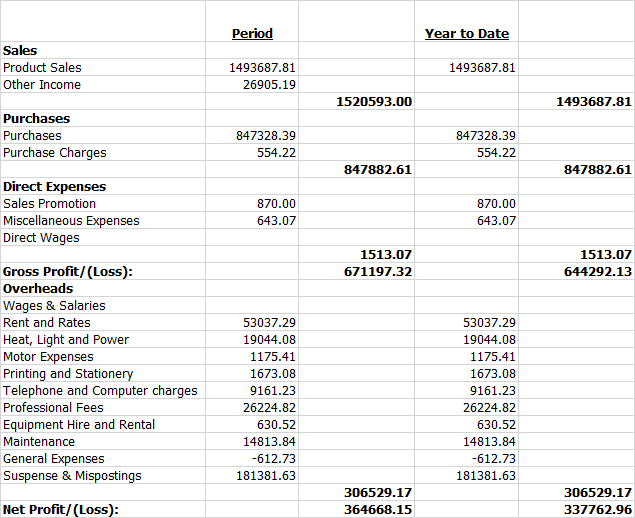 The associated costs NI, Emp.NI, PAYE and deductions various would also appear before the Gross Margin split. As I suggested in my previous post the only option other than those you suggest is to recreate the P&L as a custom report with all of the Direct costs associated with sales above the line? Technically it wouldn’t be difficult for us to add an option so that the direct expenses are rolled into COGs on the P&L. It would need to be an optional account level setting as we’ve used this P&L format from day one and this change would most likely not suit all users. For now I will make a not on our short term planner for this to be reviewed in more detail. I’ve had a bit of a ‘play’ with the ‘Create Report’ function but that seems to be more for graphs & charts than an ability to create a P&L lookalike report … is that right? That’s pretty much correct. It’s limited in what it can do, but generally it can be used for adding and subtracting various nominal code values and generating both the graph and the table. Yes I am a Power User but not yet enough info to get the benefit from the segmented report… we only started with Quickfile in Feb and so are still entering data; but yes will use that once we’re fully functional… again with the report creator, once we have some meanigful data input we can start to test that out. We have now introduced an account level setting that will merge the direct expenses into the Cost of Sales section on the P&L. You can enable this in Account Settings >> Advanced Features. That’s great… thank you very much! Impressed with the speed of the update! Implemented works a treat. Great feature. That’s great to hear, thanks for letting us know. How did i miss this?!! I suppose i don’t do any ‘management reporting’ and most of the times just pick the figures from QF P&L and type them into the accounts production software that I use to file at CH. p.s I didn’t see a formal email to notify users of this update. I just happen to see the post in the forum.